I snipped some stems to put on the table, do you know what, I don't think our table has been without flowers a-top of the mandala centre-piece since early May, isn't that a lovely thought? .....a symphony of summer reds and pinks! I put the jug beside my bed, does anyone else give themselves bedside flowers? You really should give it a go, the pleasure of waking up to the sight of a few colourful blooms just inches from your nose is really worth it. When we holiday in Dorset, our bed there is supremely comfortable, it has a deep divan base and a newish mattress and a light but cosy feather duvet. But there is nothing nicer than the comfort of your own bed, is there? I love my bed, so very much, more than I think is completely normal actually. Looking at the above photo, I think to myself I really, really must hang that beautiful framed print on the wall, it should be on the wall above my bed, not propped up there beside my bed on top of my books! I bought the print last Autumn after stumbling across it on Facebook and falling in love with the quirky style and delightful stitchiness of it. Would you like to take a closer look? Whilst settling down at home this week I have enjoyed being back in my own dinky little kitchen space. I have baked (fruity flapjacks and oaty cookies) as a little bit of home baked goodness is often very much appreciated by the Little People during school holidays. I've got some browning bananas to see to in a day or two (I love this recipe), which is perfect fodder for that "I'm staaaaaaaaaaaaarving" thing that my kiddos do without fail every day at 4pm. I confess that it's not been so easy to ease back into cooking meals, in fact I've found that cooking up a nutritious family meal from scratch every day has felt like a real chore this past week. I loved the beach barbecues and easy no-cook salad meals we ate whilst on holiday! However, I have thrown myself back into the kitchen, even trying out some new recipes - this chorizo and spinach paella was a great success, although the hair-raising cost of the saffron made me weep a little. One of the loveliest things about coming home from holiday is getting back together with good friends. It's a hard thing to capture in photographic form if you don't wish to include the actual Friends in person, but the above image says it pretty well I think. This is me, sat at the kitchen table of my friend at number 18 late yesterday afternoon, enjoying a glass of chilled white wine. Tracy (my studio buddy) was also there as she lives close by, and often the three of us can be found drinking, chatting, crocheting and roaring with laughter on a weekend afternoon before we each get down to the business of cooking dinner for our families. Good friends are worth their weight in gold, and I am blessed to have them so close by. Thank you for sharing your homely and friendly thoughts and feelings, it is like having a friend to chat to, when you live alone as I do! Thanks too, for the wavy pattern. I made a blanket for a baby's cot using pastel shades and I was so pleased with it. At my church we run a soup kitchen for homeless folk or those having a 'rough patch' in their lives. I gave it to a lovely guy whose life is dogged by an alcohol problem and who was going to visit a daughter from whom he had been estranged, who had just had a second baby. He was delighted to have a lovely gift to give her. Yes, so hard to get back to real life after a vacation! Your geraniums are just lovely. And ere is nothing better than sitting, chatting and knitting/crocheting with friends! Hello from Spain. First I would like to apologize for my horrible English. I'm a big fan of yours, I love your crochet work. As for saffron, in Spain usually use "colorante alimentario" which has the same effect and is much cheaper. This: https://www.ulabox.com/producto/ducros-colorante-alimentario/5518 or similar. Have you made a decision about painting your back yard wall? I keep hoping you'll paint it, but I'm afraid the 'don't paint it brigade' might have dissuaded you. I love how you bring cut flowers in doors, including into the bedroom! Hi Lucy!!! First of all congratulations for your blog, it's really wonderful and you are a very talented person!!! 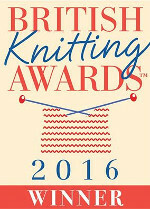 My mum love crochetting and knitting, so we've decided to come to the Yarndale festival next September!!! We live in Italy, so we would be really grateful if you could give us some suggestions! An interesting post as always. We had just 5 days away and the garden aaas parched. Everything revived with a good soaking. I love how you surround yourself with pretty things. Lots of lovely things to come home to. Your house is so lovely and colourful! Lucy, you are truly blessed with a circle of friends to talk to and have a great time with. I live vicariously through you....LOL!!! Glad you had a lovely holiday. You should try daphne beside the bed one day - the flowers smell divine so you can enjoy them even when your eyes are closed! Thanks for the email last week too - I really appreciated it! I know how you feel about cooking evening meals. I go through stages of loving then loathing it. My 4-year-old insisted on Taco Tuesday last night (inspired by the Lego Movie). I made a chicken and bean filling and all three loved making their own tacos. Not sure I want to do them every Tuesday though. Those prints cost £22 !! My goodness you do know how to spend don't you? But then again if you can afford saffron I suppose that says it all. Lovely flowers! I was in Utrecht last Sunday and they have those huge baskets with geraniums all over the city centre. Really pretty. Do have a look at my blog (in English) if you like, I added some photo's of them. I am sure you'll like the flowers. Love reading your blog, and trying your crochet items, and baking. The oaty cookies were very nice! Glad the flowers survived...get those close friends to give them a drink next time you go away and they'll reward you even more....lovely post. Wonderful to see your pots have survived and actually look great after a week!!!! That is such a pretty little wall hanging!!! !Have a colorful and happy week!!! I love your pots of flowers! And also your bedside lamp :-) So pretty.